Finance Minister Arun Jaitley today linked the near lack of public resistance to the Narendra Modi government’s move to ban currency of high denomination to the “aspirational Indians” and “progress oriented public opinion”. Jaitley also spoke on Goods and Services Tax (GST) and said he is working on seeing the regime in force from April 1 even as some of the disagreements on framing laws and regulations on this remained. 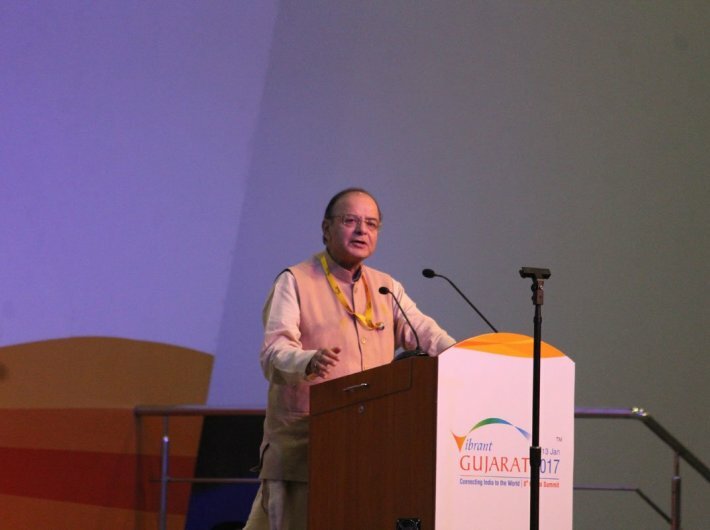 Speaking at the Vibrant Gujarat Conference, Jaitley was the only high profile government person to touch the thorny demonetization issue. The low key festivities like kite flying competition on the banks of river Sabarmati, that go alongside the high profile economic conclave and the missing stalls put up by the small entrepreneurs, were some of the visible signs of note ban in the event. He said that the demonetisation was part of the series of historic decisions taken by the Modi government to upturn the Indian economy. He said in UPA regime, the Indian economy had started looking fragile; the data on micro economics was looking down and the debate was always around where we had gone wrong and not where we should lead ourselves to. However, this, he claimed, had changed in May 2014, when Narendra Modi took charge. He also took on to the global experts who have criticized the Indian government for demonetization move without making enough preparations and heaping troubles on common people. He said most of such experts were comparing the Indian situation with the nations and societies which had high tax compliance rates. He said the passing of exit law for businesses and signing of double taxation avoidance treaties with Mauritius, Singapore …had helped end growth of shadow economy and the digital economy will also add to this. He said the digitalisation of economy will also address the narrowness of our tax ban. He claimed once the “anonymous money” will move into the banks (through demonetisation), it would lead to integration of formal and informal economy.